Open Pottery Studio & workshops available. Private lessons available most days. Walk-in Paint Your Own Pottery available during all open hours! What will you create today? Use one of our examples or let us help you make your own design! *Look for additional hours for “friends of the Tin Can” during workshop and class hours. See the calendar for event dates. What is the Tin Can Chandelier? Set in an open-spaced barn-like setting, enjoy free-flowing conversation with other fun loving creative people. 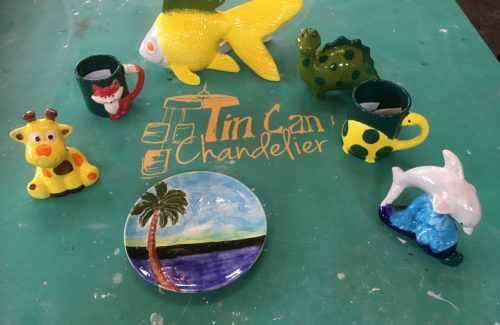 Whether you’ve been teaching collegian level art classes for decades or you just like to work with your hands making anything, you will enjoy the no-pressure environment at the Tin Can. Keelie obtained a business degree with a minor in psychology from Ashland University in 2003. She worked with the YMCA for over 11 years creating programs and working with children and the community. Although, she doesn’t have any formal art training she loves to create, learn and “try everything”. Her love of travel and exploring has helped with the vision of the TCC. When she is not at the TCC, she can be found on the family farm, in her workshop or hanging out with her kiddos. Mary has loved the arts her entire life and remembers sitting at the kitchen table as a young child drawing still-lives for fun. 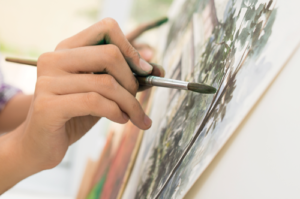 She turned her passion into a career by earning her Bachelor of Education degree from The University of Toledo and is a licensed art teacher. Mary was the Creative Director at the Tin Can for 1 1/2 years before she decided to return home to be a stay-at-home mom to her two children, Vienna and Otto. Mary continues to stay involved at the TCC, teaching workshops and classes to children and adults. In the past, she has taught art in both public and private schools and served as the Education Director at the Mansfield Art Center. 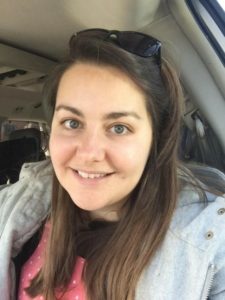 When she isn’t busy teaching or creating, you can find Mary cooking in the kitchen and spending time with her husband Pete, their two children Vienna and Otto, and Golden Retriever Abel. Elizabeth obtained her Bachelors in Fine Arts in Painting and Drawing at the University of Akron in 2011 and Masters in Fine Arts in Painting, Drawing and Printmaking at the Southern Illinois University Carbondale in 2014. She has lived in Ohio her entire life and loves the small town feel that Ashland has. She couldn’t imagine living anywhere else! 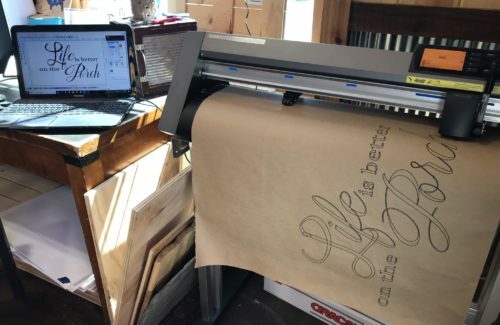 Soon after moving to Ashland, Elizabeth and her sister opened a gallery in Cleveland and served the art community by giving opportunities for up-and-coming artists in the greater Cleveland area to exhibit their work. However, she missed serving in her own community, and decided to pursue her passion for the arts in her own town. Elizabeth is excited to have the opportunity to serve her community as the 2D Lead Instructor at the TCC. Elizabeth is a passionate educator and believes that everyone should have the opportunity to be creative. Her specialties include watercolor, mixed media and printmaking. She enjoys the challenge of creating work that utilizes various forms of media to obtain a final product. 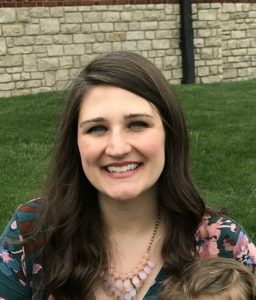 When she’s not teaching, Elizabeth enjoys spending her free time with her husband Kyle, daughters Lydia and Ruth, and painting in her home studio. Although Nataleigh Everett is young, don’t let that fool you into thinking that she comes without experience. Nataleigh concentrated on pottery and multi-media art classes while at Ashland High School. She has also completed Ceramics I and Advanced Ceramics at Ashland University. She specializes in figurative ceramics and has a passion for the slow process of hand building. She enjoys using mixed media to create personal sculptures, and is excited to teach what she loves. 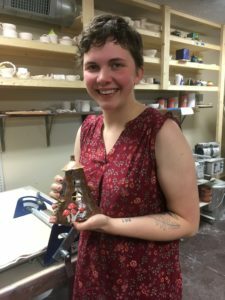 Her eagerness to grow as an artist and willingness to embrace the task of developing a ceramics program that everyone from kids to adults will enjoy is why the TCC is delighted to have her as our Lead Ceramicist. Julianna is thankful for the opportunity to teach and create ceramics with the beautiful Tin Can Chandelier community. 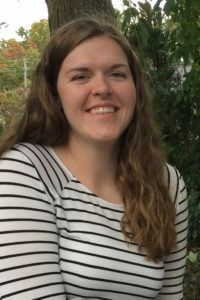 She left her hometown of Pittsburgh, PA to attend Ashland University and graduated with a Bachelor’s degree in Family Consumer Science Education in 2016. 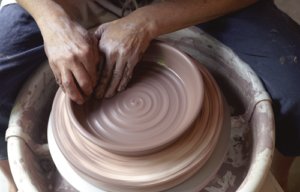 She first experienced ceramic wheel throwing in middle school and was fortunate enough to continue her passion through high school and college courses. 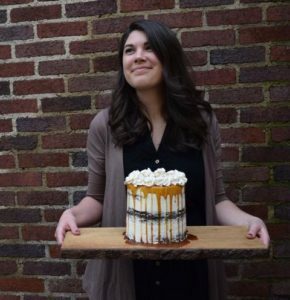 When Julianna’s not covered in clay, she’s most likely covered in flour while baking for her little business called Vines Bakery. She hopes to be able to throw some pottery with you soon! Brigitte Klotzek-Obringer (call her Gigi for short) is the S.T.E.A.M. (Science, Technology, Engineering, Art, Math) instructor. Being a mom with a highly mixed education in engineering, art and design, she started The Posh Event Designs as a graphic designer. 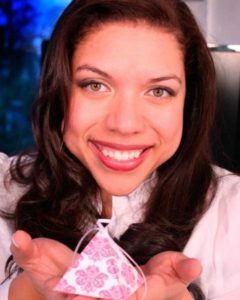 She has been featured for her party designs all over the world and was more notably featured as a Martha Stewart Dreamer into Doer. She has always enjoyed bringing science and art together from a young age and now with having a very inquisitive mini-me as a daughter, she is more passionate than ever to teach it. She has two beautiful daughters and an amazing husband who supports all of her scathingly-brilliant ideas…(yes, he has totally said that) as well as a house littered with glitter and paper at all times. She describes herself as Graphic designer, crafter, mother-extraordinaire, wife and domestic goddess in training. She believes that education is not a one-size-fits all, that we should nurture each other’s strengths and broaden our horizons with learning something new. She is very excited to be part of The Tin Can Chandelier Family and the community! Samantha is a current student Ashland University planning on graduating in May 2019. She will graduate with a Bachelors of Arts in Graphic Design as well as a Bachelor of Arts in Fine Arts. She is from Bluffton, Ohio where she first discovered her love for the Arts, in Photography and well as mixed media. She originally started her journey at the Tin Can as an intern, but she couldn’t get enough of the amazing atmosphere. She is our social media guru, as well as creates graphics and flyers for the TCC, so we are able keep all of you update what is happening at the TCC. 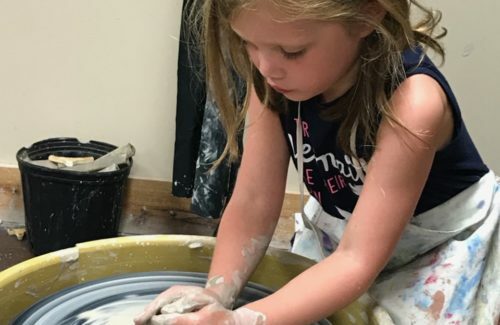 She loves to help everyone create art, and make their piece special to them. 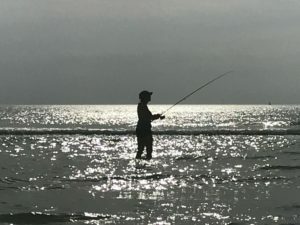 When she isn’t at the TCC, you can find her exploring nature by hiking, fishing, kayaking or participating in sports, as wells as you guessed right creating more art as she finishes up her schooling! She is grateful the opportunity getting to work at the TCC and getting to know all of you! Juli Schneeg is so grateful for this opportunity at the Tin Can Chandelier. Juli coordinates many of the additional “walk-in” projects and additional family events. She is the TCC’s Soap-Making, Glass Etching, and Lip-Balm instructor, and has also taught classes on “Green” Cleaning and Poetry. You may see her often on weekends as she is also one of our weekend staff members. She has never considered herself an artist but has always appreciated the arts and everything that goes into them. 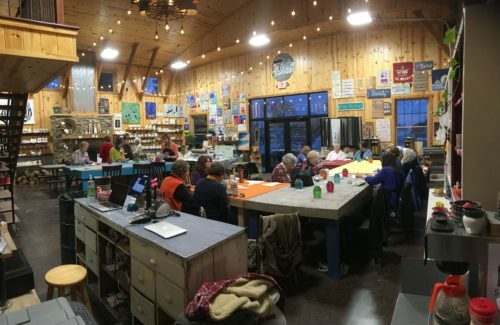 Her experience at the Tin Can has introduced her to new artistic techniques and processes that she enjoys practicing for herself and also teaching to others. In 2012, she earned an English degree from Berea College in Kentucky. For the last five years she has been a stay at home mom. When she isn’t playing at the TCC she enjoys reading, running, and finding new ways to entertain her kids. She is always looking for new experiences and ideas and is looking forward to working with you and your family! 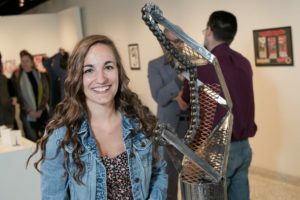 Megan graduated from The University of Findlay with a Bachelors of Art in Multi-Age Visual Arts. Art has always been a huge love and hobby of hers. She is excited to help direct others down that same path at the Tin Can. She loves teaching others to be creative and exploring different styles of art even if they think they’re not “artsy”. Megan taught Art in grades K-8th grade in Sidney, Ohio. 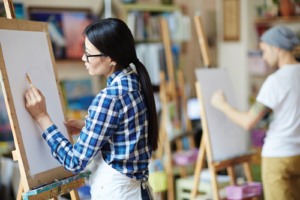 She believes that visual art education is a huge part of a student’s education and that the arts teach a student to become more confident in decision making and problem-solving. Megan loves helping first timers jump into walk in projects at the Tin Can while working and soon will have many art classes for the youth. When she isn’t at the Tin Can you may see Megan substituting within the city schools or hanging out and about with her son, Easton.